Notified district hospital at Doimukh to be functionalise immediately, said DC Papum Pare in DHS governing body meeting. 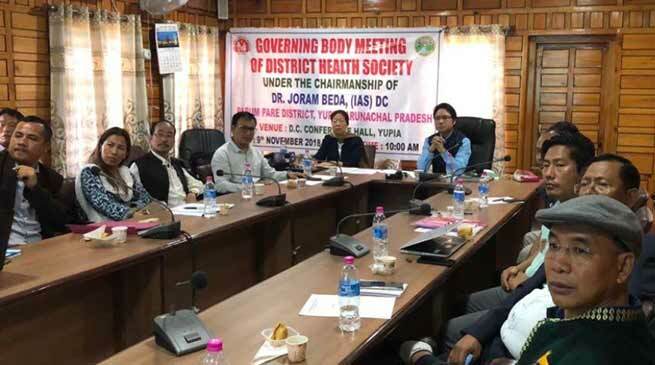 The Governing Body Meeting of District Health Society Papum Pare district, was convened on Friday at DC conference Hall, Yupia under the chairmanship of Deputy Commissioner Dr. Joram Beda. While reviewing the functioning of district health society the Deputy Commissioner Dr. Beda said that the notified district hospital at Doimukh to be functionalise immediately and the non-functional Sub-centre and PHC’s are to be rework for de-notified. He further proposed for up gradation of one Community Health Centre to First Refer Unit in the district. He also seriously viewed the non-expenditure of fund of financial year 2017-18 and directed DMO/DRCHO not to remit the RKS fund of the current financial year 2018-19 till Statement of Expenditure is submitted to the DHS Papum Pare district Yupia. He also asked DMO to ensure to put to task non-functioning RBSK team and said that the MO I/C RBSK should be stationed at DMO office and form a quick response team comprising of 2 doctors, 2 ANM & one Pharmacist and make themselves available during schools and Anganwadi centres programmes visit by DC & DMO Papum Pare, Yupia. The Deputy Commissioner directed DMO and DRCHO to issue order to all the VHSN Committee and MAS to do Swacch Bharat Abhiyan in every month in their respective Villages and Wards. It was also decided that a separate meeting is to be call urgently for those MO I/C of PHC Tarasso, Beysernyallo, Mengio, Chiputa, Jote& CHC Doimukh who have not yet utilised their RKS and other funds in their respective facility for the financial year 2017-18. The DC also strictly directed that all the fund transaction should be done only through PFMS in the district as well as in the block levels and various issues regarding financial matter has been taken up for smooth functioning of District Health Society.